This easy recipe for make ahead mashed potatoes will save your sanity when you’re hosting a holiday meal, or if you just want to prep ahead of time for your weeknight dinner. When I think about holidays of years’ past, I always remember the last-minute mashed potato scramble. Nobody likes cold mashed potatoes, so they were usually the last thing my mom prepared before the meal was served. There would be a frantic whipping and stirring and then a shout of “Dinner’s ready!” and a scrambling to the table. Then I’d sit there, trying to pay attention to the blessing being said while silently wishing it would go quickly so that I could dig into those steaming, buttery potatoes before they got cold. Thankfully, due to the lovely invention called the slow cooker, that scenario doesn’t need to happen anymore. 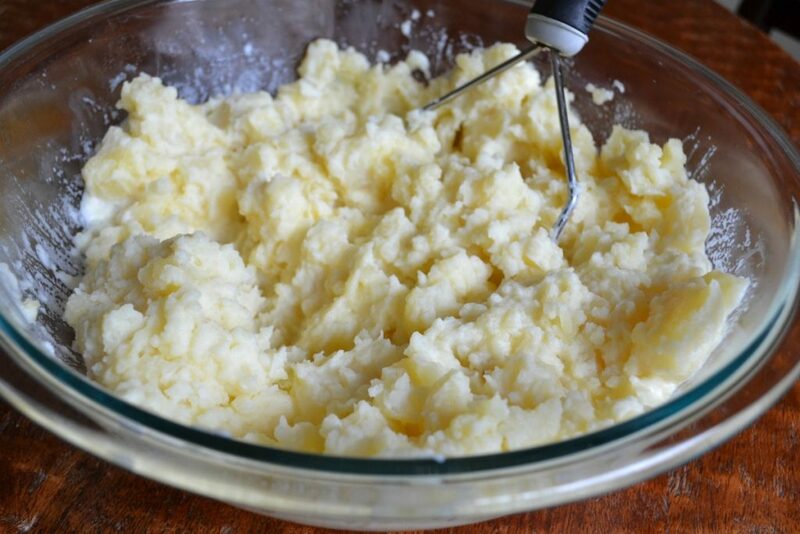 A few years ago, I realized that you could make mashed potatoes hours ahead of when you planned to eat them, and they’d taste every bit as delicious when dinner was served. No last-minute chaos. Just pure, hot, fluffy, mashed potato heaven. One thing that’s very important is using the right potatoes. I typically look for yukon gold potatoes, but I’ve also had tremendous results from Baby Bella potatoes (which I found at Sam’s club), which are super creamy. Another thing that’s important is making sure you’ve cooked the potatoes long enough. If they’re even a tiny bit undercooked, you’ll get lumps. Some people don’t mind lumps (I’m one of them), but if you’re aiming for super smooth and creamy mashed potatoes, don’t undercook! You don’t want to make the potatoes TOO far ahead or they will start to lose some of their fluffiness in the slow cooker. I’d say about 2-4 hours is ideal. Don’t forget to add butter. Just spread a thin layer of butter around the bottom and sides of the slow cooker, and include a pat on the top before you put on the lid. This will prevent the potatoes from drying out. Serve the potatoes right in the slow cooker. Since everybody has seconds of mashed potatoes (right?) it makes sense to still keep them warm while you’re eating dinner. If you have a slow cooker like mine, where the ceramic portion lifts out of the heating unit, you can place it directly on the table. Otherwise, place some of the mashed potatoes in a serving dish and leave the remaining potatoes inside the slow cooker so that everyone can have piping hot seconds that taste as good as the firsts. 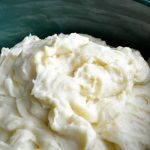 Of course, mashed potatoes are not all created equal, so in addition to giving you my make ahead tips, I want to share my recipe for getting the fluffiest, yummiest mashed potatoes possible. Enjoy! 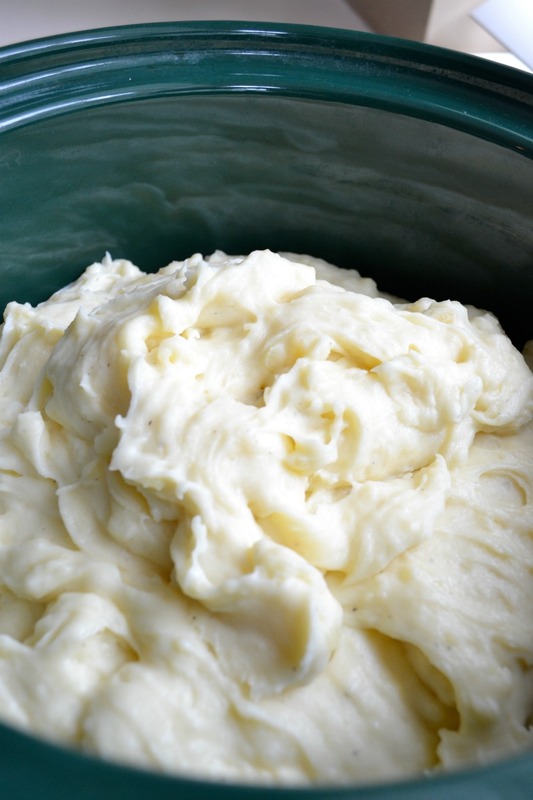 Make ahead mashed potatoes stay warm in the slow cooker until you're ready to eat. They will be hot, fluffy, and delicious! Peel potatoes and cut into similar sized pieces. Place potatoes into a large pot and cover with water. Bring to a boil on the stovetop and boil for approximately 40 minutes, or until potatoes are very soft when pierced with a fork. Drain potatoes and place into a large mixing bowl. 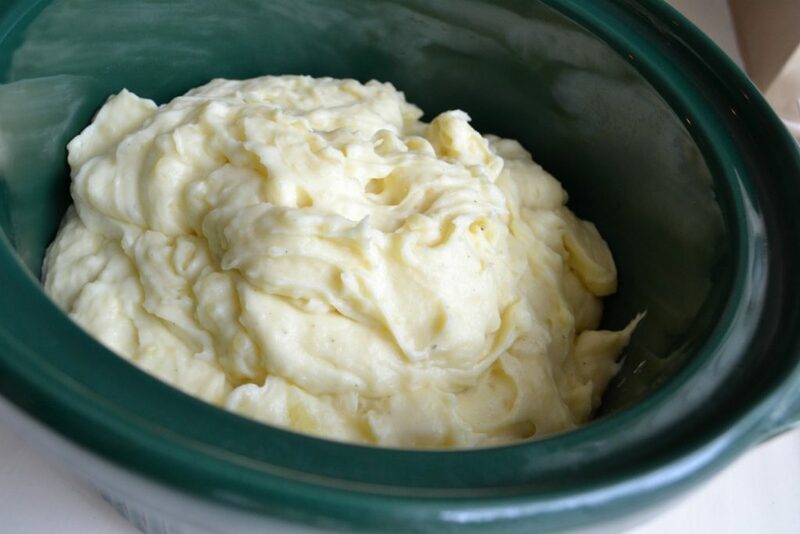 Transfer potatoes to a lightly buttered crockpot, top with a dollop of butter, and set to low. Stir occasionally until ready to serve.